The devil will promise you the things you desire most in the world in exchange for your soul, so do you have what it takes to beat him at his own game? Try your luck in the new 40-payline Devil Belles slot machine from Cayetano Gaming, featuring 100-paylines in the ultra rewarding free spins round! The game boasts some really spectacular graphics and takes you down to the depths of hell. 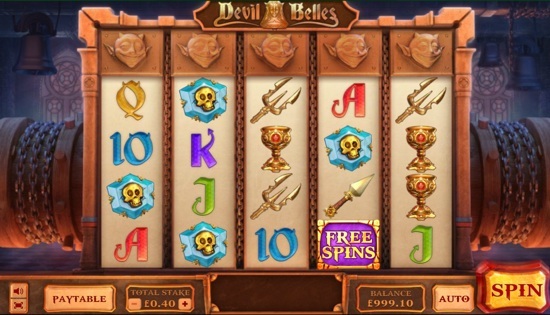 On the reels you'll find 3 special symbols including a Wild Devil, the Gates of Hell instant win scatter and the Free Spins symbol. There are other symbols to help you make winning combinations as well including a golden goblet, a blue jewel with skull on it, a pitchfork, a dagger, and card symbols. Though you can win quite a bit with the normal symbols, its the feature symbols you really want to watch for! The Free spins symbol is a purple and gold icon with "Free Spins" written across it. Land 3 or more anywhere on the reels to trigger free spins. When 2 appear, a free re-spin is awarded at an extra chance to trigger the bonus. With bigger reels and 100 paylines this round can be incredibly rewarding! Instant Win Scatters: When 3 or more Golden Gates of Hell symbols land anywhere on the reels, you get to pick and win instantly, up to 125x your bet! 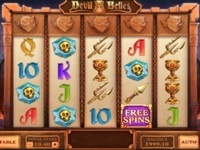 Wild Devils: The Devil with glaring yellow eyes is the Wild and substitutes for any symbol except the "free spins" and "instant win" scatters to complete winning combinations. William Hill Games - £25 Free, New Player Bonus. Fortune Spinner - Free Spins 40 Line Slot from Ash Gaming. Caspers Mystery Mirror - Classic 40 Line Slot from Blueprint Gaming. 40 Shining Jewels - Classic 40 Line Slot from Casino Technology.